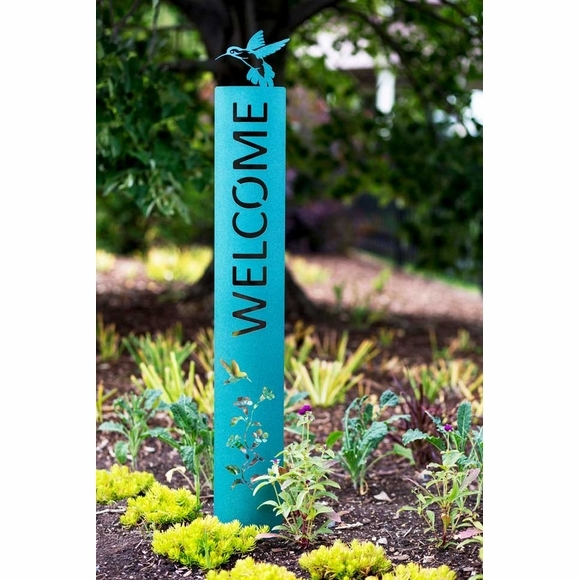 WELCOME Garden Stake - - topped with a stunning hummingbird, butterfly, deer, or angel. Laser cut steel lawn stake stands almost 4' tall. Made in the USA. Select your favorite silhouette design (angel, hummingbird, butterfly, or deer) or go all out with one of each. Note that each silhouette is associated with a specific letter arrangement and font. And please enlarge each image to see the intricate details near the bottom of the stake. Hummingbird garden stake with the word WELCOME cut out sideways so that the letter E is at the top. Butterfly garden stake with the word WELCOME cut out sideways so that the letter E is at the top. Paying angel garden stake with the word WELCOME cut out vertically so that the letter W is at the top. Deer garden stake with the word WELCOME cut out vertically so that the letter W is at the top. Now just find the perfect spot and bury the bottom portion into the ground. Made from 18-gauge steel formed with an arc. UV stable powder-coated finish ensures the laser-cut letters and silhouettes will stand tall for many years. Dimensions: 45.5" (butterfly) or 46"H (hummingbird, angel & deer) x 6"W x 0.5"D; weighs 3.5 pounds. Colors: patina (bluish color) or bronze. Custom made to order. Please allow 2 to 4 weeks for delivery. Make a unique artistic statement every time you welcome someone to your garden or front door.